The Exhibition Grounds are especially interesting, with a long tradition and an attractive location near Stromovka Park. They were built for the Jubilee Exhibition of 1891. More than 50 exhibition projects, trade fairs and a wide variety of cultural and entertainment events take place here every year. In the late 19th century revivalist efforts aimed at the identity of the Czech nation culminated and one of the opportunities how to present industrial and economic success was the Jubilee Czech Exhibition in 1891 – its full name was the General Jubilee Exhibition in Prague in 1891 to celebrate the jubilee of the first industrial exhibition in 1791 (this show even had the European primacy and took place in the Clementinum on the occasion of the celebrations of the coronation of Leopold II. Bohemian king). The exhibition was organized and equipped exclusively by Czech enterprises, because German companies based in the Czech Kingdom boycotted it. In 1888 the preparatory committee was elected, which managed to provide exhibition space within two years (Under the Resolution of the Landtag it was a part of Royal Park), develop a plan and a program of the exhibitions its organizational status and create a budget. Later works continued under the supervision of the General Committee with the Chairman Frederick Count Kinsky, including honorary chairmen Count Franz Thun and Prince George Lobkowicz; the expert committees were led by prominent personalities such as František Křižík (construction), publisher Jan Otto (editorial), architect Antonín Wiehl, director of the National Theatre F. A. Šubert etc. In 1890 the committee approved the basic construction but the final form of the exhibition ground only was approved six weeks before the exhibition opening, but at that time the construction of most of the buildings was in full swing. In September 1890, however, Prague suffered catastrophic flood (it also badly damaged the Charles Bridge) and also flooded the exhibition grounds. Refuted wooden fence collided with unfinished buildings and damages were so great that at first postponing of the exhibition opening was considered. Nevertheless, the Director of První Českomoravská Mr. Novotný, definitely said that his firm would perform its job on time thus setting an example to other companies, which in addition mostly carried out works at lower prices than usual, because the participation in this project was an honour for them. The exhibition was opened on Friday, 15 May 1891 attended by many eminent personalities including Archduke Karl Ludwig. For the duration of the exhibition till 18 October 1891 2.5 million visitors visited the exhibition including the Emperor Franz Josef I. From the very beginning the Palace of Industry formed the centre of the exhibition. Other important buildings included the engine room with a prefabricated iron construction, i.e. the pavilion for display machines, which was situated in the lower part of the exhibition and was sold to Innsbruck after the exhibition. The lighting of the Exhibition was due to the participation of Mr. Křižík of course electric; also the light fountain designed by himself was electric. To facilitate the transport to the exhibition ground Mr. Křižík also designed the first electric tramway in Austria-Hungary leading from Letná to Stromovka. In the Pavilion of Czech tourists, which was later transferred to Petřín (today labyrinth) among other things accommodated the diorama by Liebscher brothers called "The battle of Praguers with the Swedes on the Charles Bridge”. Hanavský Pavilion was used as advertising of Hořovice iron foundries and was transferred to Letná Park in 1898. In front of the entrance to the Palace of Industry there was a statue of George of Poděbrady by Bohuslav Schnirch, which now adorn the town of Poděbrady. To the right of the main entrance there was the Pavilion of the Capital City of Prague, modified in 1907, which today serves as the National Museum Lapidary. Opposite to it, there was the original Art Exhibition Pavilion, which has remained at its places until now as a part of the Academy of the Fine Arts. Behind this building the Pavilion of the Regional Committee of the Czech Kingdom was built (now Pražan restaurant). Also the restaurant of the town brewery in Plzeň, so-called Plzeň restaurant is still functional. Sightseeing flights in captive and free balloon were among popular attractions of the Exhibition. R. 1895 the Slavic Ethnographic Exhibition was held here followed by the Exhibition of Architecture and engineering in 1898, where Jan Kříženecký screened his first films. This year also the second panoramic picture called the Battle of Lipany by Luděk Marold was installed here. 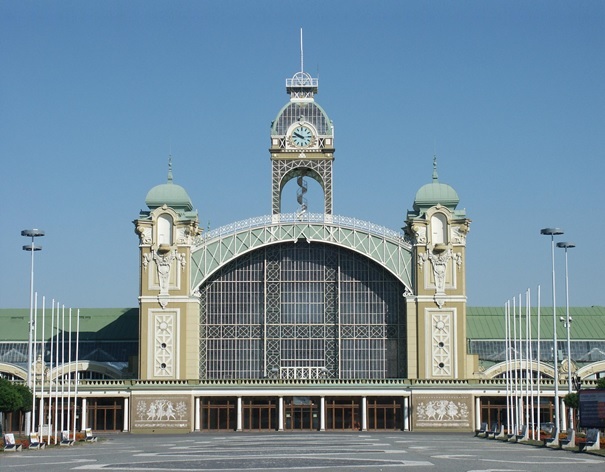 In 1908 was Commerce and Trade Exhibition Association exhibition was held here, for which a new business pavilion designed by architect Jan Kotěra and his pupils Josef Gočár and Pavel Janák was built. Unfortunately it has not been preserved till these days. After 1918, the fairgrounds became part of Prague Trade Fair. The tradition of fairs was limited after 1948 (they were moved especially to Brno, later also to the Strahov Stadium and to Letňany) and the Industrial Palace was renamed as Congress Palace because the congresses of the Communist Party were held there. The exhibition area itself was then called the Park of Culture and Rest of Julius Fučík (PKOJF). In 1960 the Brussels Pavilion, which represented our country at the Expo '58 in Brussels and won two big prizes for architecture and exposition (architects František Čubr, Josef Hrubý and Zdeněk Pokorný) was moved to the exhibition grounds. Prague thus had another 6,000 m2 of the exhibition area, but only until October 1991, when the building burned down. Since the beginning of the 1990s exhibitions and fairs began to return to the exhibition area. In 1991 the General Czechoslovak exhibition was held there; Křižík Pavilions behind the Industrial Palace and the Pyramid Theatre used mainly for musical performances were built there. Also the Křižík fountain was restored, although its design completely changed compared to the original. In 1999 the replica of Renaissance Shakespeare's Globe Theatre was built at the former Forest and hunting pavilion beside Marold panoramic picture, which, however, was completely destroyed by fire in November 2005.